We all know it: Thanksgiving Day can be a long one. While you wait for the turkey to roast or during your recovery between turkey and pie, you may want to fill the time with something besides lying on the couch and moaning loudly. 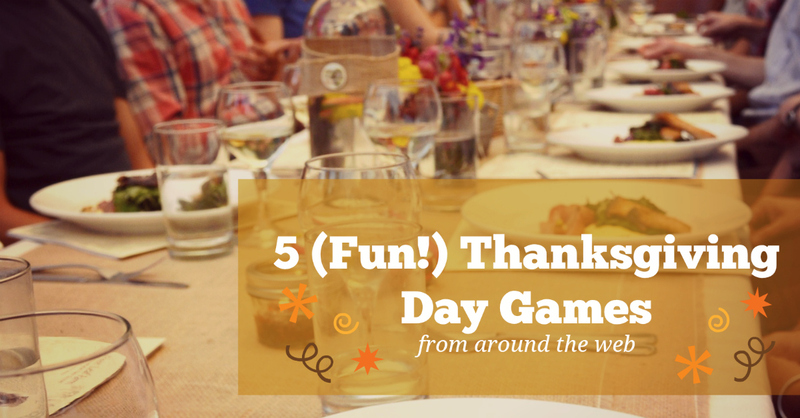 We’ve collected five family-friendly, smile-worthy games from around the web that are great for your Thanksgiving crowds, family or friends, big or small. Thanksgiving Bingo (Flavor Wire): This version of bingo will appeal most to the snarky cynics in your crew. Flavor Wire has created four (hi-larious!) bingo cards, which participants cover as the day progresses. When you observe things like a fight over political views, a whining child, or even a drunk uncle, you’ll place a chip over that square. Best of all? The “Free Tryptophan Space” in the center. The Best (The Idea Room): Who’s got the smallest shoe size? Who can eat the most marshmallows in a minute? Find the answers to these questions—and much more—when you play a raucous round of The Best. Divide your group into two teams and compete in contests that are so arbitrary and ridiculous, you can’t help but play. Now, whose thumb is the shortest? Blind Turkey Artist (Creative Youth Ideas): Fluffed feathers, spindly legs, bewildered eyes: These are just a few of the things your own hand-drawn turkey may have. Gather your crew and see who can draw the best turkey—without looking! This version suggests placing a book on your head and using that as a drawing surface, but it’s just as fun to simply close your eyes. Aunt Edna, you put the beak where? Parlor Games (One Kings Lane): The folks at One Kings Lane have provided this list of clever and modern twists on classic parlor games, like charades, proverbs, and the tray game, and divided them up by which room of the house your group is in. Ready to throw your smile, channel your inner diva, or exercise your memory muscle? This list is for you.